Of all London's open-air cinema experiences, this is perhaps the most bizarre: for filmgoers watch what's on offer from an inflatable hot tub that can take up to six people. So, while sipping on a glass of bubbly and watching cult favourites like Dirty Dancing, the audience is surrounded by simmering 40 degrees bubbles themselves. 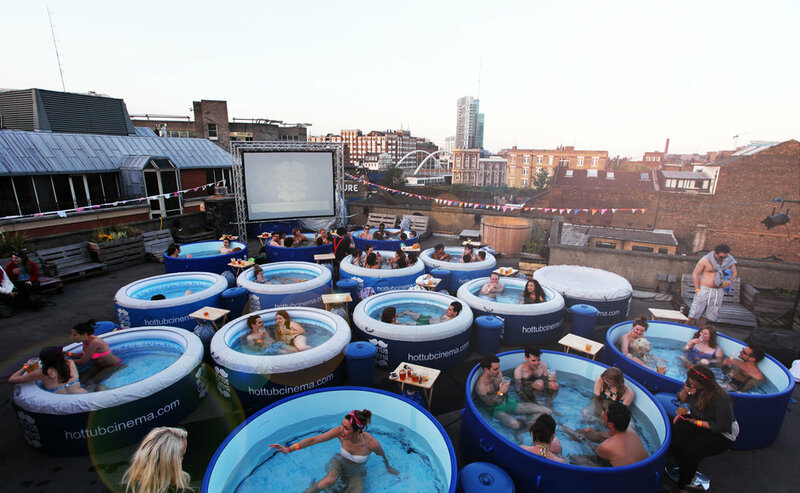 Back for 2015, The Hot Tub Cinema comes to the former Shoreditch Underground, a transformed railway station in the heart of Shoreditch where 20 hot tubs, two screens and a bespoke surround-sound system have been installed. Guests will be treated to a choice of classic films: the Lion King, Top Gun, Grease, Ghostbusters and Dirty Dancing. The only rules: keep your swimwear with you at all times and mind the gap between the train and your hot tub. What are the best dining options near Hot Tub Cinema: Tub Tropicana Tour London? Hot Tub Cinema: Tub Tropicana Tour gyms, sporting activities, health & beauty and fitness. The best pubs near London Hot Tub Cinema: Tub Tropicana Tour. Hot Tub Cinema: Tub Tropicana Tour clubs, bars, cabaret nights, casinos and interesting nightlife. Where to have your meeting, conference, exhibition, private dining or training course near Hot Tub Cinema: Tub Tropicana Tour. From cheap budget places to stay to luxury 5 star suites see our discounts for Former Shoreditch Underground Station hotels, including 196 Bishopsgate Serviced Apartments from 85% off.